The aim of this study was to compare the diagnostic performance of gadobenate dimeglumine (Gd-BOPTA)-enhanced MR imaging, including dynamic phases and one-hour delayed phase, versus superparamagnetic iron oxide (SPIO)-enhanced imaging for detection of liver metastases. 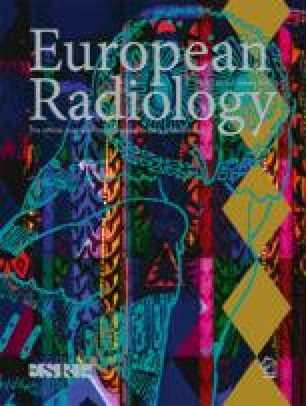 Twenty-three patients with 59 liver metastases underwent Gd-BOPTA-enhanced MR imaging (unenhanced, arterial, portal, equilibrium and one-hour delayed phase) using three-dimensional volumetric interpolated imaging and SPIO-enhanced T2-weighted turbo spin–echo and T2*-weighted gradient-echo sequences on a 1.5-T unit. Three observers independently interpreted the three sets of images, i.e. Gd-BOPTA-enhanced dynamic MRI (set 1), delayed phase imaging (set 2) and SPIO-enhanced MRI (set 3). Diagnostic accuracy was evaluated using the alternative-free response receiver operating chracteristic (ROC) analysis. Sensitivity and positive predictive value were also evaluated. The mean accuracy (Az values) and sensitivity of Gd-BOPTA-enhanced delayed phase imaging (0.982, 95.5%) were comparable to those of SPIO-enhanced imaging (0.984, 97.2%). In addition, Az values and sensitivities of both imaging sets were significantly higher than those of Gd-BOPTA-enhanced dynamic images (0.826, 77.4%: p<0.05). There was no significant difference in the positive predictive value among the three image sets. Gd-BOPTA-enhanced delayed phase imaging showed comparable diagnostic performance to SPIO-enhanced imaging for the detection of liver metastases, and had a better diagnostic performance than Gd-BOPTA-enhanced dynamic images. The authors wish to thank Bonnie Hami for her editorial assistance in the manuscript preparation.